Saturday was a fabulous day. The city of Bethlehem, Pennsylvania hosted a one-day, entirely vegan street festival, the Bethlehem VegFest, and it was beyond anything I could have imagined. 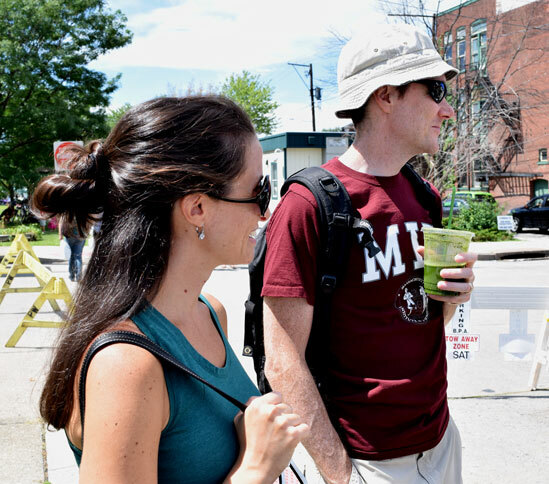 When I first heard that the event would be held this summer, I started following updates on Facebook and that’s how I learned that the organizers were looking for volunteers to do a vegan cooking demonstration as part of the day’s activities. Although I had never done a live public demo before, I eagerly volunteered for the opportunity to contribute to VegFest, and I’m so glad I did! The festival itself was mind-blowing. There was a staggering lineup of food vendors, from the nationally renowned local bakery Vegan Treats and the amazingly delicious Shankara vegan restaurant located just a short walk away from the festival, to the nearby city of Easton’s Greenmouth Juice Bar & Cafe, to the famous Cinnamon Snail food truck from NYC, and lots more. 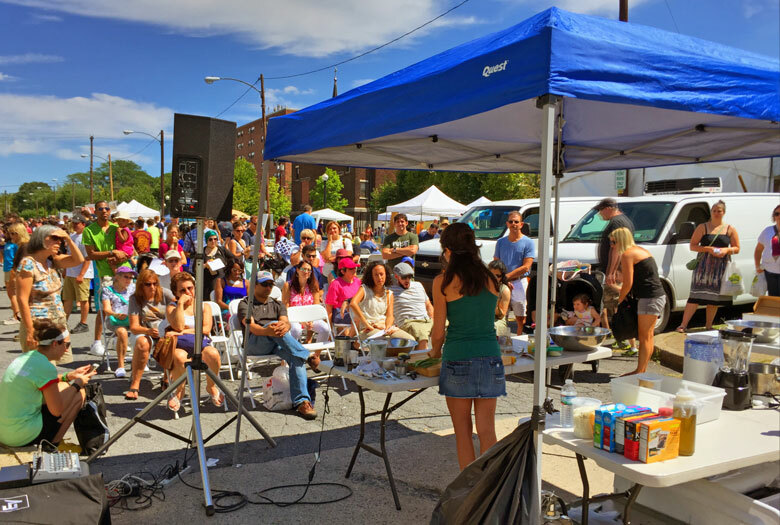 How cool is it to attend a street festival where everything edible is vegan?! 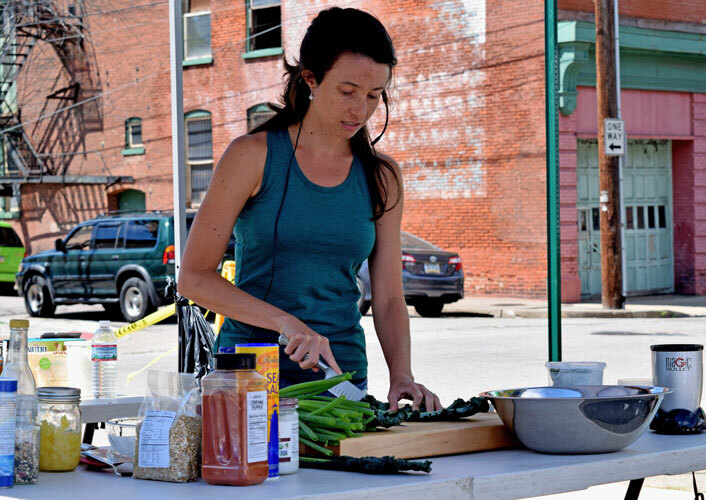 Several non-profit organizations were also represented, from the new and growing Bethlehem Food Co-op and Lehigh Valley Vegetarians to animal activist associations like Sea Shepherd of Philadelphia and the Pig Placement Network, as well as vegan-friendly local businesses like salons, jewelry artists and others. The turnout was surprisingly big. It really makes me happy when I see how vegetarianism and veganism are becoming more widely accepted and adopted in mainstream society, because I sincerely believe it’s healthy for people and hugely beneficial to the planet on the whole. I was extremely nervous leading up to my presentation. As I started to address the audience with my introduction I was on pins and needles, but once I started cooking, everything went smoothly and I just felt like I was sharing something I love with friends. I had so much fun! Photos of me are courtesy of my sweet friend and yoga buddy, Deepa, who kindly supported me with lots of encouragement. Thanks Deepa! My husband caught this shot of the audience – We had a great turnout! Cook your buckwheat. The trick to getting fluffy, al dente buckwheat (instead of overcooked, gloopy, porridge-like buckwheat) is to soak it for about a half hour and rinse it thoroughly until it rinses clear, then simmer it in three parts salted water to one part grain (3 cups of water for 1 cup of raw buckwheat groats). Simmer for no more than 8 minutes. Then immediately pour the cooked buckwheat and cooking water through a strainer and rinse it thoroughly with cold water to stop the cooking and rinse away the excess starch. 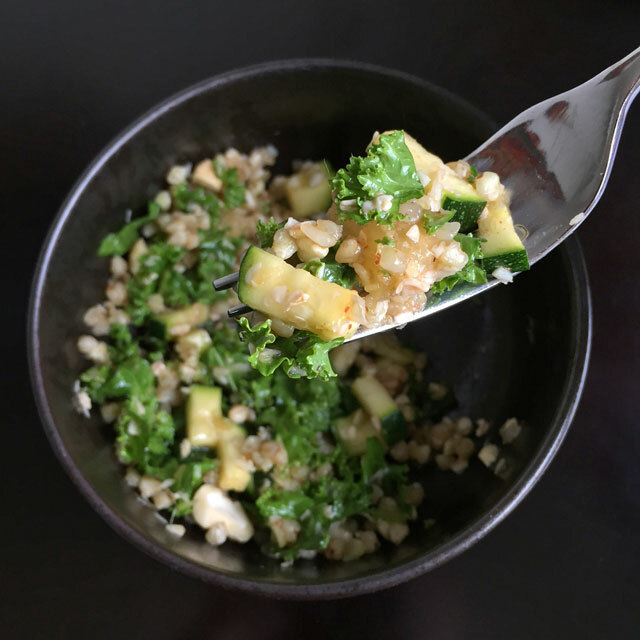 In a large bowl, combine the cooked buckwheat (or other grain), chopped kale leaves, chopped zucchini, sliced scallions and pineapple tidbits. In a small bowl or blender (I use a Magic Bullet, it’s so handy! ), combine the grated ginger, pineapple juice, nama shoyu (or soy sauce or coconut aminos), rice vinegar and Thai red curry paste (or cayenne pepper). Whisk or blend until thoroughly combined. Add the shredded coconut and chopped cashews. Stir to combine. Season with freshly ground black pepper and a generous dash of sea salt. Taste and adjust the seasoning as needed. Serve at room temperature, or refrigerate and serve up to 1 day later. Buckwheat (not a cereal grain but a fruit seed) is a good source of protein because it contains all eight essential amino acids. A modest one-cup serving of cooked buckwheat contains 6 grams of protein, about the same as one large egg. Buckwheat is gluten-free. It also provides dietary fiber and minerals such as magnesium, manganese and copper. It also contains the bioflavonoid rutin, which is helpful to the circulatory system. Kale is a nutritional powerhouse, and a good source of calcium, iron, folic acid and vitamins K, A, C and B6. As a “superfood” high in antioxidants, it is reported to be effective at preventing certain cancers, delaying the effects of ageing and reducing inflammation, as well as boosting the body’s detoxification mechanisms. Ginger is known to reduce inflammation in the body, aid in digestion and improve circulation. Coconut contains lauric acid, a medium-chain fatty acid that is metabolized and converted to energy easily by the human body rather than being stored in the body like other long-chain fats. 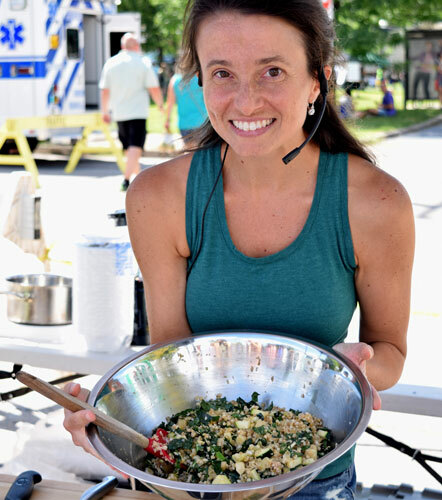 4 Responses to "Pineapple Coconut Buckwheat Salad"
What a wonderful experience! Looks like a real yummy recipe to display and teach. Awesome opportunity and I am sure you did a great job! what a fantastic post! a superb recipe (I tasted the dish, then came back for seconds and THIRDS), told in the setting of an exciting story and awesome event. loved reading, and loved eating!